Home » General Interest » What Are The Differences Between British & American English? 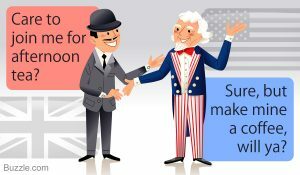 There is an old saying that America and Britain are “two nations divided by a common language.” No one exactly knows who said this, but it does seem to reflect how we Brits feel about American English. But are American and British English really so divergent, and if so what are the key differences ? The most obvious difference are accents. Whilst Britain has a vast range of different regional accents none are quite like any in the US. Likewise within the US there are some very different accents for instance consider the Texan and a New Yorker modes of speech. The one big factor in the divergence of the British & American accents is “rhotacism”. The General American accent is rhotic and speakers pronounce the r in words such as hard. The BBC-type British accent is non-rhotic, and speakers don’t pronounce the r, leaving ‘hard’ sounding more like hahd. It’s interesting to note that before and during the American Revolution, the English, both in England and in the colonies, mostly spoke with a rhotic accent. Another noticeable difference between American and British English is vocabulary. There are hundreds of everyday words that are different. For example, Brits call the front of a car the bonnet, while Americans call it the hood. Fortunately, most Americans and Brits can usually guess the meaning through the context of a sentence. The differences below are only a general rule. It’s fair to say that American speech has influenced Britain via pop culture, and vice versa. Therefore, some prepositional differences are not as pronounced as they once were. There are more difference but I think we’ve covered the most pertinent. However it’s worth pointing out that British and American English have far more similarities than differences. We think the difference between American and British English is often exaggerated. If you can understand one style, you should be able to understand the other style.